Melbourne has a thriving film shooting community. Whether you are a rusted-on believer in the old ways, or simply film curious, living in or visiting this city gives you an opportunity to buy gear, meet other like-minded folk or just get your analogue fix. other organisations you should know about. This aims to be an all-inclusive list. It is not a set of hand-picked recommendations. I do try and keep this information current but please contact labs you discover via this list to check opening hours and services offered before heading across town as things are ever-changing. If you are aware of any errors or omissions, please do get in touch and through the magic of 20/20 hindsight all will be made good. The urbanlight Australian Film Photographer Index may also interest you. Here they are, all known Melbourne photo labs in Alphabetical order, including some notes on what they do and where they are. Melbourne Massive Lab List google map. Most of the labs listed above also stock _some_ film. Vanbar and Michaels are most likely to have what you need. PhotoQ, also stock more than most. Other non-lab stockists of film include The Fox Darkroom and Melbourne based online retailer Walken’s House of Film. Ikigai Camera also good stocks available locally. Many international web retailers sell film and analogue gear for example – B&H, Adorama and The Impossible Project. Stock mostly (but not solely) instant cameras, classic and new. Windows on Lonsdale Street display second hand gear, also a good place to meet other film shooters. A bit of a Melbourne curiosity, only open for an hour or two a day, has two cabinets of interesting film cameras at the back of the store. The rest of the store contains miscellaneous analogue or unidentifiable items. Several repairers will be able to assist with repairs of analogue gear. The Asia Pacific Photobook Archive (APPA) a not-for-profit open-access physical archive of self-published and independent photobooks. The APPA is established to provide a ‘real’ way to see photobooks that would otherwise only be viewable online. The MCC have been around since 1891, and are worth checking out. There has been quite some progress in the availability of darkroom space in Melbourne in recent years. Strange Neighbour (Fitzroy) Darkroom access is for members, rates are available on their website. The Fox Darkroom (Kensington) Offering darkroom hire and analogue photo courses. In 2016 they added a gallery space and also stock film and darkroom chems. Noir Darkroom (Coburg) analogue photography collective opened in April 2017 offering workshops, darkroom time and an exhibition space. There are several galleries in Melbourne that either specialise in photography or almost do. Mr Alan Adler working on one of Melbourne’s few remaining analogue photo booths. The booth was recently moved from the Elizabeth Street Entrance to Flinders Street station to a new spot, still on Flinders Street but a little closer to the main station entrance. This Guide is maintained by Chris Zissiadis, keen film snapper and shooter of Melbourne things. Please let me know of any errors, omissions or new stuff. Email me, or leave a comment below. I have had 120 film done at L and D One Hour Photo. Thanks Will, I’ll check that out and update the list. Turns out he still does 120, develop only, can’t scan or print from 120. Cool, there is also hillvale.com.au opening up on Black St. in Brunswick. Not sure of their services. Thanks Will, yeah am on to Hillvale, they open up at the end of July, doing c41 35mm and 120 initially, with B&W down the track, Quite cheap too, although they wont be open 9-5 as such. Thanks for this, I’d been meaning to mention these in the guide. I know the booths at the Elizabeth Street entrance to Flinders Street Station are analogue, and the booth that was located at the top of the escalators near the La Trobe Street and Swanston Street corner of Melbourne Central (the floor where the cinema is) was analogue, but I’d need to check that it’s still in operation and not swapped to a digital booth since all the changes at Melbourne Central. do you know how to get in touch with analogue photobooth dude? No, but I’ll have a look for some contact info on the Flinders street booths for you and get back. I’ve not seen him in a while, which is a bit of a worry. A few changes to the lab list today. Updated Jade Studio (mentone) details, there were rumours that they were closing down, but these were false, great news. Any other changes or additions, please let me know. Which is the cheapest place to develop 35mm film? I don’t list prices in the guide at this stage, price is not an indicator of quality – good or bad. If you have a lot to develop most places will do a deal with you so I’d suggest you get in touch with a few labs. Expect to pay $7 for develop only 35mm. At the moment Hillvale are new and reasonably priced. Light Leaks also have a special on Tuesdays which makes their services pretty economical. But please get in touch with labs near you. 2. Noted that Elizabeth Photo Centre (CBD) is rumoured to be closing down. 6. Added Ruffian Gallery and Source Photographica to galleries. Thanks a lot for maintaining this list. Unfortunately the Pro Lab on Toorak Rd. seems to have closed / turned into a massage place, at least that’s the impression I got from driving by the other day. Thanks for the comment Bernd, but I am happy to confirm that The Pro Lab are still there, full service lab. They moved a few doors closer to Chapel Street a year ago (today as it happens) but definitely still at 209 Toorak Road.South Yarra. Also I currently have some medium format film (Portra 800 and 400) available on ebay. Hoping to think of a way to keep the booths open. I’ll send you what I have via email Augusta. What about real printing? ?as in negs not scanned and made to digital prints…anywhere still doing that? Hi Kate, yes I’d like to have that information included, I plan to contact all the labs soon to get updated information and will ask them specifically about “optical” prints. There aren’t many that I’m aware of and none that I have personal experience with but I have heard people mention Bond Imaging still offer this service. Cool thanks man! Yeah wasn’t sure of the term 🙂 always think it defeats the purpose to shoot with film to have digital prints!! A few changes to the list. The Kodak lab at the end of Elizabeth Street in the CBD closed in March 2014. I’ve also added ACME to the list of darkrooms, although they are in Yarra Glen. Added Borg’s Digital Photo Express in Moonee Ponds to the lab list. Am now looking to find someone else to print Dad’s fab B&W negs from 60-70 years ago as sadly Borg’s in Moonee Ponds has just recently closed. This website is very helpful and maybe my salvation. Many of the labs listed will be able to help Dom. It’s worth contacting the labs and getting a price on the lot. Let me know how you get on, best of luck, it’s a rewarding thing to do. Really loving this guide. I’m getting into film photography, and I was wondering if there was a guide that includes stores that sell film cameras around Melbourne. I really like seeing the physical things before buying them. Hi Ashan, I’ll update the list with this information once I’ve had a chance to gather it all together, thanks for the question. Stores vary depending on whether you are looking for new or used gear, and if new whether you are looking for lomography type products or foilm cameras manufactured by the major digital equipment guys. You can check out lomography gear at a few “fashion” stores around town, search for Urban Attitude and Incu. Photo labs and stores that stock cameras include Michaels (mainly second hand or high end new), Camera Lane (mainly second hand), Light Leaks (a bit of everything, mainly new lomo), Filmneverdie.com (mainly new and used instant photography gear). There are more, but that’s an off the top of my head start for you. Thanks so much! I’ll check them out. Sad news that Light Leaks lab in St Kilda has closed its doors. Light Leaks was a very popular hub for film shooters and it will be missed by many of us. The closure is immediate, if you have film still with them then email admin@lightleaksphoto.com. I’ve added The Edge Photo Imaging, Collingwood and Dandenong Image Centre to the Lab List. Acme et al in Yarra Glen not only have a darkroom for hire, but still process and print commercially up to 20×24″ – they only handle B&W. They re-located from Punt Road, South Yarra in ’04 – they were Acme Black + White back then… remember the b+w hereford cow fence? Maybe too long ago, but anyway they’re still around. Thanks for the information Morgan. I’m in the process of checking the details of everything listed in the photolab section of this page. I’ll add acme to that section soon. Added Photo Barn Burwood to the list, 35mm plus black and white hand developing. I need to verify details. Thanks to Yuval for letting me know about them. Prism Imaging have announced that they are ceasing E6 processing effective immediately. They are still doing C41 and true black and white. Thanks for the list Chris!!! I still have rolls of medium format Fujifilm for my Hassy, would be good to use it this winter!! You’re welcome Aldona, that would be great. Congratulations on being a 2014 Bowness Prize finalist as well, all the best with the announcement. Great unexpected news from MGA this morning after watching Germany win the World Cup Final!! Many thanks for this list. I’m a film shooter, but a Melbs neophyte (from NYC originally, but have lived in NSW for the past 13 years). Heading in for a weekend break at the end of August to meander around town & also check out the BIFB Collection 14 event… and now I have just the guide I need to carry with me. Found my way here from MSM on flickr as I know you folks are always super helpful in this dept. That’s great Didi, thanks for the comment, have a terrific stay in Melbourne. Kmart also do 35mm film processing. It takes about a week or more as they send the film away to get processed. Kmart is worthy of a mention sure particularly if you don’t live near a lab. But I’m only listing labs that do some form of processing in house at this stage. Kmart, Teds and most of the other major photo retail chains will take your film for you, I’d recommend using a lab on this list however, particularly as many of them will be very happy to take your film via mail order and you can communicate any specific needs you have. Edmund Pearce Gallery in the Nicholas Building recently announced its closure. Borg’s imaging, Moonee Ponds, no longer processing film. I’ve removed references to several labs that were in the list but marked as closed down. Also worth noting that the analogue photo booth, which was located at the Elizabeth Street entrance to Flinders Street Station has reappeared a few metres further along Flinders Street, closer to the main station entrance. A very useful and comprehensive listing. I’ve used a few of the pro-level labs for many years, all the while seeing others come and go (e.g. LaTrobe Studios). Great work Chris! We are a family run business that processes as well as prints B&W film. We also accept mail order. Please check out this website for more details. An update to film processing, Bond Imaging no longer process E6. Thanks Deryk, yes, you are correct ceased E6 at the end of Oct 2015. I’ve updated the list. Got another gallery to add to the lsit: Magnet (http://magnet.org.au/) @ 640 Bourke St, down the Spencer St end. Yep, … the beginning of the end perhaps…. Several labs large and small bit the dust in the first half of 2016. I’ve removed The Edge (Collingwood/Burwood) and Photobarn Burwood from the list, and a forthcoming audit of the labs will no doubt unearth several other closures. Added Andrew’s Antipodean Photographic Emporium, located in the Tyabb Packing House. A great source for cameras, accessories and general analogue photo curios. Updated the Gallery list to note closure of Ruffian in Fitzroy, and Strange Neighbour in Fitzroy, although Strange Neighbour’s darkroom remains open. Thanks for visiting Peter, and yeah, i’ve been at it for decades and not grown tired of Melbourne streets just yet. Added links to the Noir Darkroom and Gallery in Coburg, sounds pretty cool! Hi, My name is Andrew Wittner and I have a very good b&w film studio/darkroom situation in my home in Heathmont 3135 where I process and print b&w films, both for myself and other people, using traditional equipment including 6x9cm autofocus enlargers onto silver-gelatin fibre-based paper, currently using Ilford’s very good MG FB Warmtone in gloss and semi-matt. I do workshops in b&w photography, processing, and printing, or can process and print for you or with you in my darkroom. Contact me on 0412120166 if I can help! Added Work In Process (Northcote) to lab list. Thanks so much for this list!! 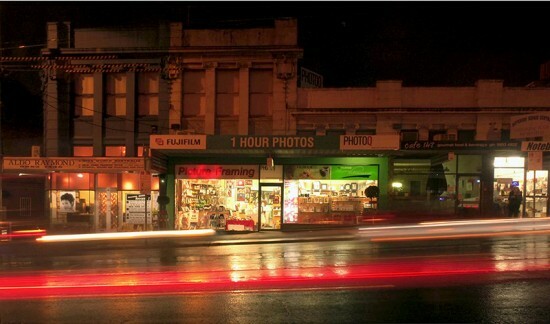 The Digital Camera Warehouse in Northcote develops and prints film, as well as sells film. They send the film off to Sydney for developing, so it takes about a week. Its $18 for dev, print and scan for basic colour film. Not sure if they sell film cameras or not. Hey, Peter from Ikigai Camera here! Thanks for maintaining this great resource!